Cook pasta according to package directions. Meawhile, in a large saucepan, saute garlic in butter over medium heat for 2 minutes. Stir in flour and salt until blended. Gradually add milk. Bring to a boil; cook and stir for 2 minutes or until thickened. Remove from heat; set aside. Drain pasta and toss with oil; set aside. Add 1 inch of water to a large saucepan; add broccoli. Bring to a boil. Reduce heat; cover and simmer for 4 - 5 minutes or until crisp-tender. Drain and rinse with cold water. 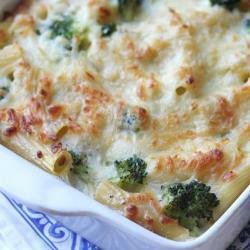 in a 13 x 9 x 2 baking dish coated with nonstick cooking spray, layer 1 cup white sauce, half of the pasta and broccoli and 1/2 cup of cheese. Repeat remaining layers. Top with remaining sauce and cheese. Cover and bake at 350 degrees F for 25 - 30 minutes or until heated through.